Located in the historic Mt. Pleasant neighborhood of Washington, DC, we are minutes from downtown, near Rock Creek Park and Columbia Heights. We are located at 3253 Mt. Pleasant St. NW on the corner of Park Rd. and Mt. 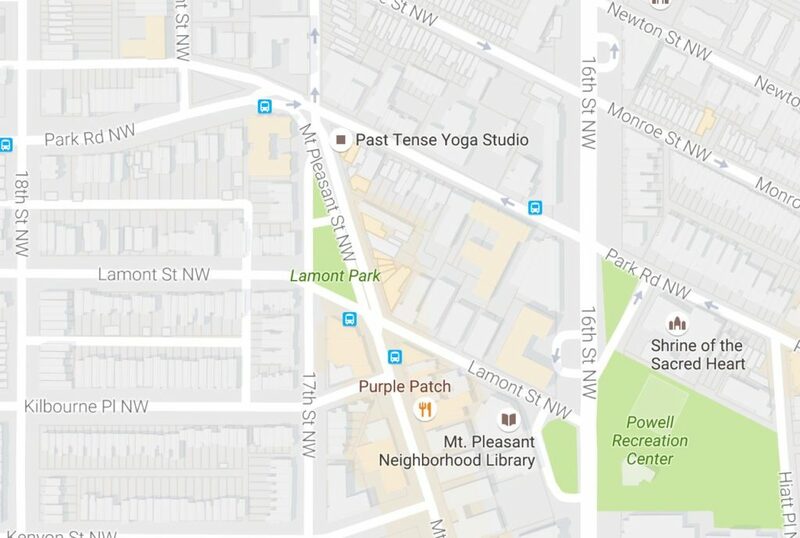 Pleasant St. — just a block from 16th St. and four blocks from the Columbia Heights Metro. We host two classes a week in our pop-up space at Lost Origins art gallery at 3110 Mt. Pleasant St. NW. On our schedule, these classes are noted with @ Lost Origins after the class name. Parking: On-street parking is available, but can take some time to find on the weekends. Bike: Bike racks are available right outside of the studio and Capital Bikeshare has a location across the street.